So Choir! is the brilliant social singing experience! So Choir! is all about hanging out with friends and singing. We get together each week and learn to sing great pop and rock hits together in spine-tingling harmony. Just turn up, meet up and sing! 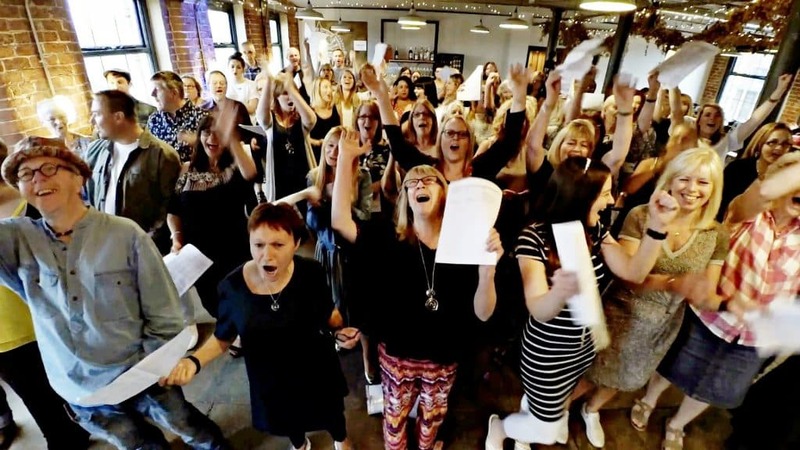 It doesn’t matter if you’ve never sung before or feel you can’t sing very well, there are no auditions, no sheet music, no commitment or stuffy rules and you’ll never be made to sing on your own – in fact, forget everything you’ve ever imagined a choir to be because So Choir! just couldn’t be more different. We meet up in cool bars to sing pop and rock songs together in awesome harmony, accompanied by great live music. Here’s how it works: You show up and say “Hi” to other lovely people who like to sing. Then, you get a copy of the lyrics and become part of So Choir!. You choose to join a group of highs, mids or lows and together, bit by bit, we have an absolute blast assembling the song in harmony. Come along on your own or with friends. All our events are super-friendly, relaxed and our fun vibe will instantly put you at ease. So Choir! is short for Social Choir after all! We currently meet every week in LEEDS and WAKEFIELD with more locations coming soon. Wanna come sing with us? Easy! Visit our Meetup.com group and RSVP to our next session. If you’re not already a Meetup.com member, its simple and free to sign up. Then, just turn up, meet up and sing! So Choir! 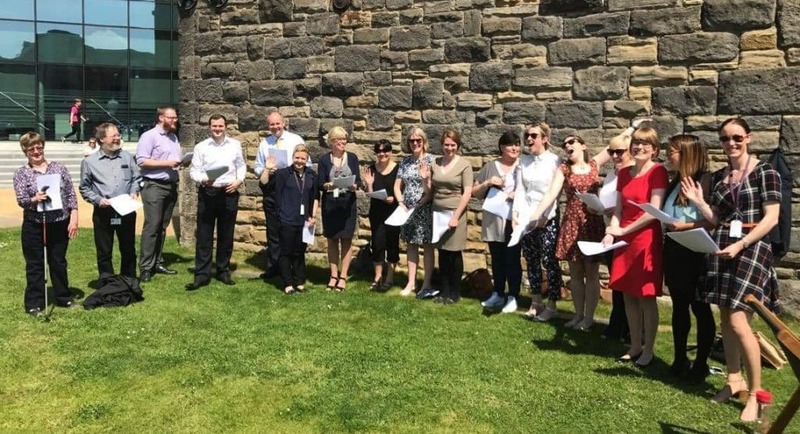 Wellington Place Workplace Choir in Leeds enjoying the sunshine! We love to get everyone together to make videos for our YouTube™ channel. Check out some of our videos below! We love hearing from you, so do keep in touch and stay up-to-date with our latest videos by subscribing to our YouTube Channel. CLICK HERE!